Growing up, Wesley learned the game of golf from her grandfather – a game which taught her integrity and respect. She went on to play at the collegiate level for Appalachian State University in North Carolina. While playing golf, Wesley’s thirst for adventure led her to join the college’s ROTC program where she met and fell in love with Larry. He eventually led her to Christ and they were married in 1993. Both Wesley and Larry joined the Army after school where they initially served together as Lieutenants and then as Captains. About seven years after getting married, Wesley and Larry welcomed their first little girl, Ryann, into the world. Not long after, they welcomed their second, Ellie. When they started a family, Wesley left the active-duty military while Larry stayed in, ultimately becoming an Airborne Ranger. Despite her loss, Wesley created and lead the 82nd Airborne Division Wounded Warrior Committee, an all - volunteer organization that visited and provided comfort items for the wounded Paratroopers of the All - American Division. In 2009, the National Military Family Association recognized her as a Very Important Patriot, an honor only given to five volunteers each year from around the world. After college, the opportunities to play golf became more infrequent. Although during early army life, Wesley and Larry would find creative ways to play golf. When Ryann was born in 2000, golf officially took a back seat, “Motherhood was all consuming and wonderful. 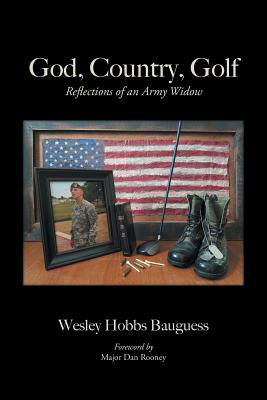 Golf retreated and became the furthest thing from my mind,” recalls Wesley. She barely touched her clubs again until after Larry’s death when she was invited to a dinner by the Patriot Foundation in 2007. The mission of this organization is to provide support for the families of fallen, wounded, injured and ill Airborne and special operations soldiers through educational and child-care grants. Wesley said she would go if she could play in the golf tournament. “By the grace of God, my golf swing came back to me like a true old friend,” shares Wesley. Since 2008, Wesley has been serving as an ambassador for the Patriot Foundation. She speaks twice a year to their corporate sponsors. “I am delighted to lend my voice to them, help them raise funds and play a small part as they strive to take care of those left behind,” shares Wesley. Ryann and Ellie were presented with college scholarships from the Folds of Honor Foundation, which provides educational scholarships to the families of those that have been killed or wounded in overseas battles, by founder Dan Rooney in 2009. Two years later, Wesley was asked to be a speaker for the Folds of Honor Foundation. Her speaking engagements are at golf events throughout the United States including Pebble Beach, Bandon Dunes and Mountain Air Country Club to name a few. She has played with Lee Trevino, Brian Kilmeade, and Craig T. Nelson. “In every place, every event, every moment, I felt Larry with me. I have been so honored to say his name out loud for so many years,” shares Wesley. Wesley was a distinguished Military Graduate. She received her Regular Army commission into the Medical Service Corps in May 1994. She served as a treatment platoon leader, medical company executive officer and combat health support officer as a Lieutenant in the 101 sties Airborne Division (Air Assault). After graduating on the Commandant’s list from the Combined Logistics Officer Advanced Course, the now Captain Bauguess served as the Adjutant and Personnel Officer for the 2nd Infantry Division Support Command in the Republic of Korea. She resigned her active duty commission in 1999, but continued her military service in the United States Army Reserves and Individual Ready Reserves until 2004. After 2004, Wesley led Family Readiness Groups, providing leadership and support to countless military families. “I always thought true love only happened once in a lifetime. I figured I was lucky to find true love with Larry. We had a beautiful life and a love that would sustain me until the end of time. I never expected to find true love again, but I did,” shares Wesley. In 2013, God led Wesley to a good Christian man named Morgan. Two years later, they married and began a new life together. Today she has three amazing stepsons. Wesley and her girls are happy, busy, and loving their new family.